“This is half-baked justice at best,” US District Judge Jed Rakoff wrote earlier this week in disgust. He had just signed off on a “paltry” deal between the Securities and Exchange Commission and Bank of America. The SEC sought punitive damages on behalf of BofA shareholders, rightfully accusing the bank of lying to its investors before, during, and after its 2008 merger with Merrill Lynch. Bank of America executives did not disclose the details of the Merrill deal with shareholders – a criminal variety of fraud that helped bring BofA stock from $26 a share the day the merger was announced to $3 a pop five months later. The penalty the SEC sought for this multibillion-dollar hustle: $33 million. Judge Rakoff actually rejected that amount in late 2009, saying then that the deal “does not comport with the most elementary notions of justice and morality.” Thus, the SEC came back with an amount this week they saw more fitting: $150 million. Holding his nose, Rakoff approved it. The $150 million fee is just 4.1% of the $3.6 billion in 11th-hour bonuses Merrill execs awarded themselves days before they merged with BofA. It’s an even smaller fraction of the $4.4 billion bonus pool Bank of America (BAC) henchmen enjoyed last year. Bank of America raked in revenues exceeding $120 billion in 2009, making this settlement about one tenth of one percent of annual revenue… 0.12%. For the typical American, who makes about $45,000 a year, that’s a fine of 54 bucks. Indeed, that was Goldman’s story from 1999-2002… the firm paid over $28 billion in bonuses with money it “earned” from underwriting BS tech IPOs and bribing Silicon Valley execs with underpriced shares. The SEC gave them an equally pathetic slap on the wrist, and as Taibbi noted, most of the major players got filthy rich and entered high-stakes positions in government. Surprise, surprise… one of the biggest winners of that scheme, former Goldman CEO Hank Paulson, ended up playing a pivotal role in the Bank of America/Merrill Lynch boondoggle. In 2008, then Secretary of the Treasury Paulson brokered the deal, insisting that government involvement was necessary to contain the dreaded “systemic risk” that would occur if Merrill went bust. Here’s how that went. NYAG: Had it been up to you. Given that Paulson, as Treasury secretary, also oversaw the SEC, what you’ve got here is a colossal clusterf&*k of corruption and conflict of interest. Perhaps the SEC isn’t as incompetent and flat-footed as they seem, but rather playing out the final act of a play arranged by Paulson himself. Alas, all these good deeds have gone unpunished. Hank Paulson is retired, with an estimated net worth of $700 million. Ken Lewis, the gentleman that he is, forwent his 2009 salary and bonuses, only to be fired shortly thereafter… but still earned $148 million in his eight years at the bank and left with another $135 million in retirement benefits. John Thain, the infamous jackass at the top of Merrill Lynch, who spent $1.2 million in bailout bucks redesigning his executive office, laid low for a year and was recently named CEO of CIT Group (CIT), another distressed financial. Rest assured, he is filthy rich as well. Oh, yeah… he’s a former Goldman Sachs (GS) executive, too. What a coincidence. For the rest of us, the cost is high – so high that the actual cost is still unknown. The US government (under Paulson’s guidance) bailed out Merrill and Bank of America to the tune of about $45 billion. 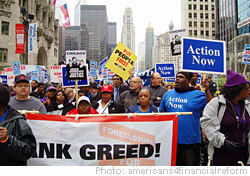 The Treasury offered Bank of America a $97 billion backstop for future losses on Merrill’s assets. BofA was kicked another $7.5 billion in the “Asset Guarantee Program” and $800 million for the “Homeowner Affordability and Stability Plan,” whatever the hell those programs are. Some has been repaid, some has not, some will just disappear. And those bold (or stupid) enough to be holding Bank of America shares at the time of their Merrill Lynch acquisition will be rewarded with the SEC’s $150 million bounty. According to Capital IQ, that’ll come out to 1.7 cents per share. Whatever pathetic gain that might be for shareholders, Bank of America has already managed to offset it. Yesterday, the very day after Judge Rakoff announced his verdict, BofA convinced its shareholders to approve a massive stock dilution. Shares fell 34 cents on the news. The bank needs capital to pay back outstanding government loans, the new executive board says, and they don’t know how else to raise the money.